Do you ever feel like someone just reached into your head and squished your brain like a giant stress ball, and that it’s taking forever to regain its shape? I’m all out of smarts. I barfed the last of them onto the table at today’s job interview and now I’m just sitting around, watching remixes of Gangnam Style on YouTube with my mouth hanging open. The sorry sight of me in my pajamas looking lobotomized in the evening is becoming too common, and is the one drawback to the sudden increase in interviews I’ve had lately. I’m drained. The average hour-long job interview is preceded by at least eight hours of performance anxiety and trying to remember all the stuff I’ve ever done at work while wondering what compelled me to get this stupid haircut that I have no idea how to style. The interview is then followed by five days of questioning, of wondering “WHY WOULD YOU SAY THAT, WHAT’S WRONG WITH YOU? !” and doubting all of my life choices. I’ve gone through this eighty-thousand times since April. Was my mother right? Should I have learned a trade? Would I have owned a home by now? 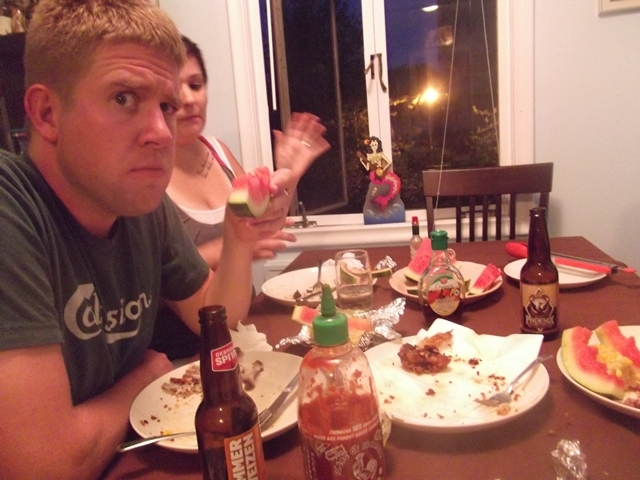 Awkward first Internet dates might be less fraught. 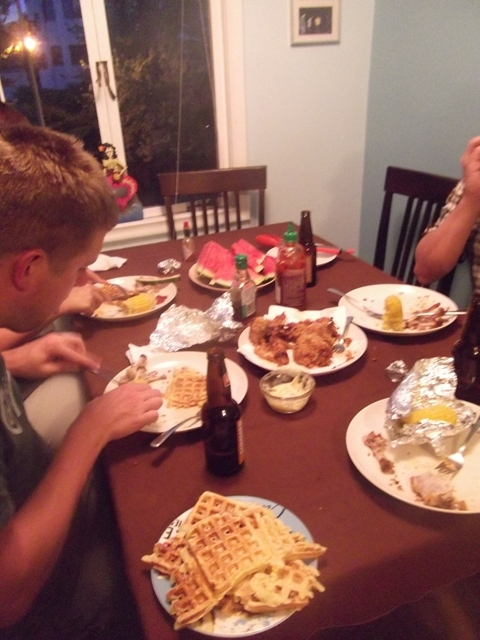 This past week, with corn season underway and my friend Missy’s desire for fried chicken and waffles at an all-time high, we invited both Missy and Greg over for a weeknight dinner party and ate fried meat served on carbs and drizzled with maple syrup and hot sauce until we felt no more feelings but fullness. They talked and we laughed and everyone felt okay about life as we slumped onto the couches afterward. That sounds weird, doesn’t it? 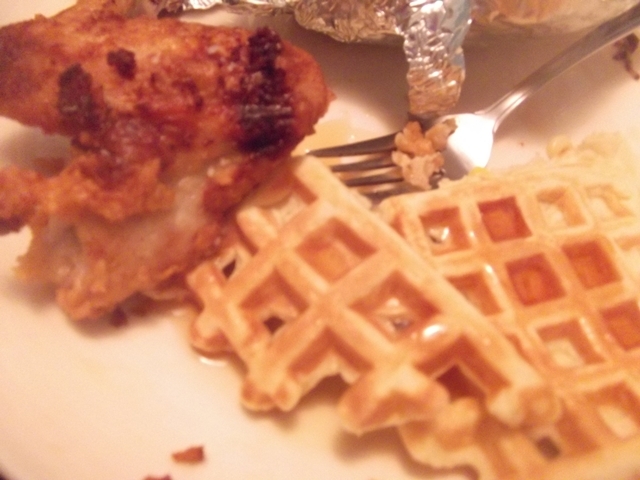 The chicken, waffles, hot sauce, and syrup combo? It does here in Canada, because until recently that combo was only available to us through our TV screens via Diners, Drive-Ins, and Dives. I promise you that it’s delicious. It works for reasons I am not even sure I can explain. I mostly wanted to tell you about the waffles though. They have corn in them, and the kernels pop in your mouth as you bite down on them, and they’re sweet. Some people think corn is a vegetable, so a plate of waffles is practically a square meal (regardless of the shape of your waffle iron). Well, maybe not. But they’re quick and you can have them in the time it takes to complain about not knowing what to make for dinner. You’ll be back to watching PSY videos online in no time. 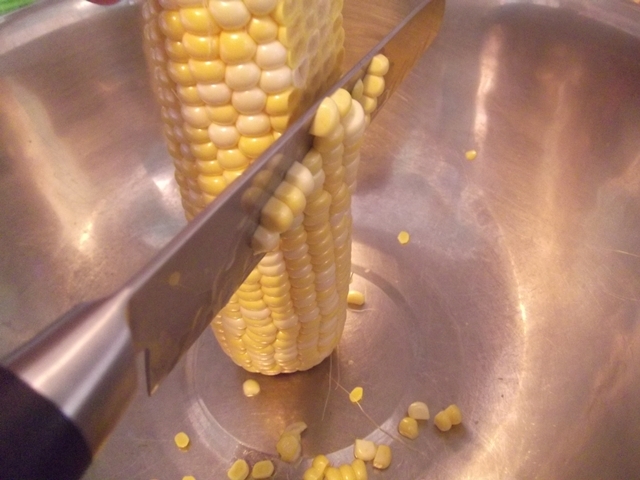 Cut the corn from the cob. If you would prefer not to get it all over everywhere, cut the corn into a bowl. 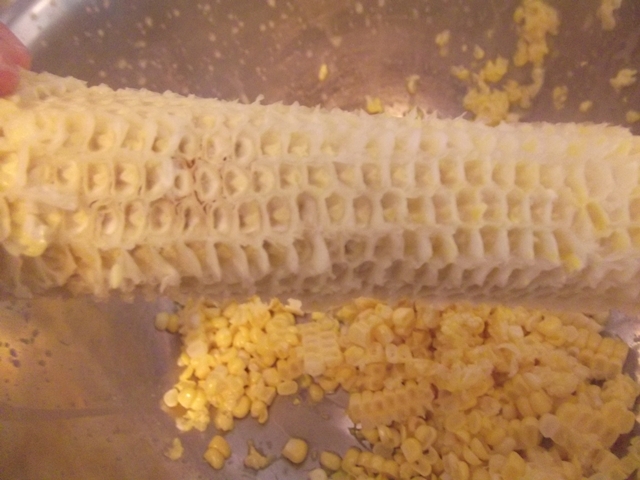 Once the kernels are off the cob, scrape the cobs with the knife to get any remaining kernel bits and corn juice into the bowl as well. Sift the dry ingredients onto the corn kernels. In a separate bowl, whisk together the liquids. Stir the liquids into the dry/corn mixture and stir until no flour lumps remain. Heat the waffle iron according to your waffle iron’s instructions. Spray the thing down with canola oil, top and bottom. Pour batter into waffle iron, drop the lid, and cook until waffles have stopped steaming, and are golden and fluffy. Don’t lift the lid during cooking, or else they flatten out and get floppy. Serve hot from the iron, doused in syrup. Or topped with chicken. Whatever gets you where you need to go. < Previous You CAN have too many giant turnips. Next > Candied pork belly. Oh my! This whole meal looks fabulous. I’m on a waffle kick lately. And you can’t be doing too badly because my brain has never figured out that cutting off the kernels into a bowl thing. It’s a stroke of genius! I wish I had known your cob/bowl trick last night when I was making corn soup. Cobs make great stock … my method made a huge mess. This post made me laugh – humor and despair make great bedfellows, and you’ve played it well. And no, you should not have learned a trade. I love cornmeal waffles, and tomorrow I will try your waffles with actual corn. Cheers. I wanna come over for dinner. 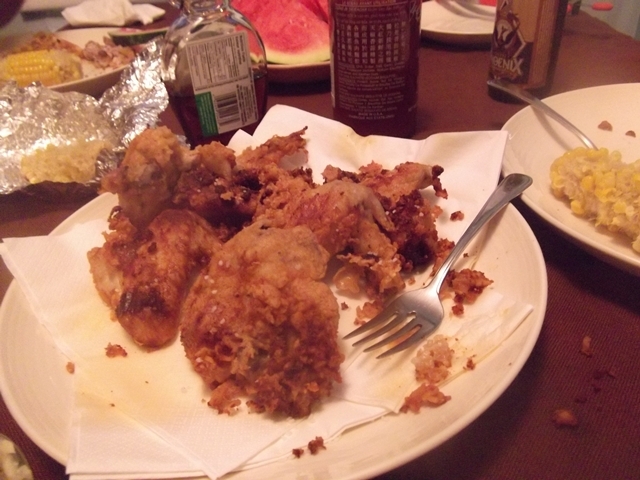 Sorry your job interviews are sucking the life out of you- but at least there is still fried chicken. I have been stressed as hell lately, and I am also now afraid to step on a scale. If only I could be one of those people who “just can’t eat” when they are stressed. You guys are nice! I also wish I was the kind of person who didn’t eat when stressed. Ugh. Snacking my anxiety away! 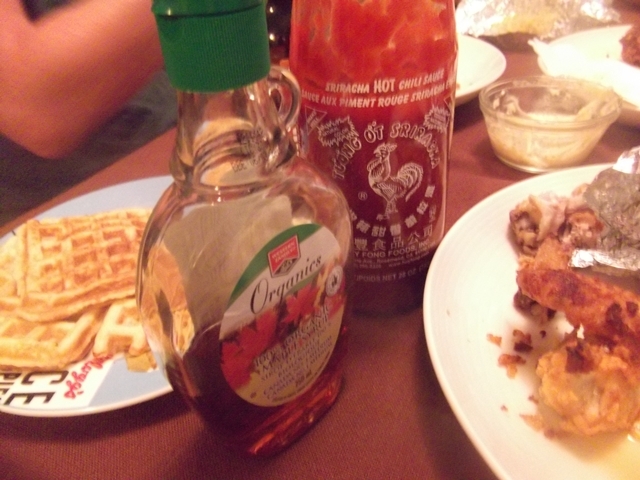 I always put sriracha on my pancakes. Usually sriracha and honey or apple sauce. I also put it on slices of bread and/or plain tomatoes and/or my tongue sometimes, so, take that as you will. That dinner sounds like a fantastic combo. Ooooh, good idea! Thanks! Alton Brown knows everything.